Austria Plan allowance is for Calls, texts and data usage in Austria. Any Calls in these Packets will allow the customers to call Landline and Mobiles at a flat discounted rate without a connection charge to the Austria national networks. All prices inclusive VAT. A Packet is valid for 30 days including the day of purchase.  Each Packet could be purchased via a one off payment using the existing top up balance; therefore customers are required to have the minimum required balance on the account. You will be activating only one type of Packet at a time. All Packets will be auto renewed on expiry, therefore customers must keep the required balance to auto renew the Packet, unless it’s been cancelled by dialling *190#. Any calls or SMS after the Packet allowance will be charged on the Standard rate with a connection charge of 10cts. International calls & Texts, Short numbers Calls, calls to special and premium number calls & Texts and other value-added services are excluded from your allowance. Any unused minutes or Texts allowance after the validity period will not be carried forward. Lycamobile reserve the right to amend or vary the terms of this promotion, or to withdraw this Packet at any time on a reasonable . The offer is valid from 20/02/2019. Effective 1-1-2019 the amount of data in your domestic bundle will change allowing for additional data usage while roaming. Please refer to your specific bundle description for further information. The below mentioned prefixes have been excluded from bundle calls and SMS. Lycamobile Pakistan plan (‘the offer’) inclusive allowances are for calls from Austria to standard Pakistan landline and mobile numbers. Other usage will be charged at standard rates. The offer is valid for 30 days from the date of purchase. A customer may have only one plan on their account and may not buy another from the same bundle during the 30 day validity period. Bundle is subject to auto renew after 30 days. Lycamobile reserves the right to replace or amend the offer or these Terms & Conditions or to withdraw the offer at any time on reasonable notice. Note that promotional credit (credit which Lycamobile has given to customers for free) cannot be used towards purchasing a bundle. The offer is for non-commercial, private, personal use only – Lycamobile reserves the right to withdraw or suspend the offer or to disconnect you if we suspect that offer is being used for commercial purposes, for conferencing, or if it is not being used in a handset (in a SIM box for example), or if it is being used for tethering. The Pakistan plan valid from 26/09/2015. Lycamobile Ausland plan (‘the offer’) inclusive allowances are for calls from Austria to selected countries landline and mobile numbers. Other usage will be charged at standard rates. The offer is valid for 30 days from the date of purchase. A customer may have only one plan on their account and may not buy another from the same bundle during the 30 day validity period. Bundle is subject to auto renew after 30 days. Lycamobile reserves the right to replace or amend the offer or these Terms & Conditions or to withdraw the offer at any time on reasonable notice. Note that promotional credit (credit which Lycamobile has given to customers for free) cannot be used towards purchasing a bundle. The offer is for non-commercial, private, personal use only – Lycamobile reserves the right to withdraw or suspend the offer or to disconnect you if we suspect that offer is being used for commercial purposes, for conferencing, or if it is not being used in a handset (in a SIM box for example), or if it is being used for tethering. The Ausland plan is valid from 08/10/2015. Lycamobile Philippines Globe bundle (‘the offer’) inclusive allowances are for calls from Austria to the first 5 dialled Globe telecom mobile numbers in Philippines only. Other usage for those exceeding maximum of first five dialled numbers and usage in excess of your bundle allowance will be charged at standard rates. Calls are rounded up to the nearest minute for the purpose of calculating remaining allowances. Bundles are valid for 30 days from the day of purchase. A customer may have only one offer on their account and may not buy another during the validity period. Any remaining allowance after the validity period will not be carried over into the next period should the customer repurchase their offer. Lycamobile reserves the right to replace or amend the offer or these Terms & Conditions or to withdraw the offer at any time on reasonable notice. Note that promotional credit (credit which Lycamobile has given to customers for free) cannot be used towards purchasing a bundle. 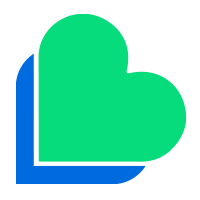 The offer is for non-commercial, private, personal use only – Lycamobile reserves the right to withdraw or suspend the offer or to disconnect service if we suspect that the offer is being used for commercial purposes, for conferencing, if it is not being used in a handset, if it is being used for tethering, or is being used in a SIM box or similar use. Promotional period: the offer is valid from 20/02/2019. Any unused data will expire on the expiry date of main bundle. Lycamobile reserves the right to replace or amend the offer or these Terms & Conditions or to withdraw the offer at any time on reasonable notice. The offer is for non-commercial, private, personal use only. The offer is valid from 17/01/2018. *Unlimited Minutes to call the following countries: Austria, Belgium, Bulgaria, Croatia, Cyprus, Czech Republic, Denmark, Estonia, Finland, France, Germany, Greece, Hungary, Ireland, Italy, Latvia, Lithuania, Luxembourg, Malta, Netherlands, Norway, Poland, Portugal, Romania, Slovakia, Slovenia, Spain, Switzerland , Sweden, United Kingdom. 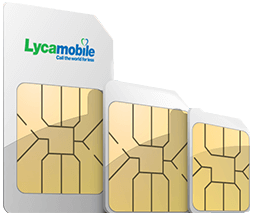 If you are currently not a Lycamobile customer pick up a new SIM and be sure to top-up with enough credit Using your Lycamobile SIM, dial *139* Packet code# (e.g. *139*1100# for Packet 100) If you don’t have enough credit to buy the Packet you will be prompted to top-up and try again You will receive a confirmation message shortly after buying your Packet stating that it has been applied to your account. You should wait for this message before starting to use your Packet allowance. Every time you will be able to check your balance by dialling *137# (then press call) for free of charge.  We will automatically renew your Packet once it expires – all you have to do is stay topped-up and we will take the cost of the Packet and any sharers from your credit (we will remind you to top-up and give you the option of not renewing your Packet). Dial *190# before the expiry date and follow the instructions OR Call Customer Services on 322 from your Lycamobile or 0123008322 from another phone (call charges may apply) before the expiry date. Please note that any auto-cancellation request made on or after the expiry date will not be accepted. The offer is valid from 17/01/2018. 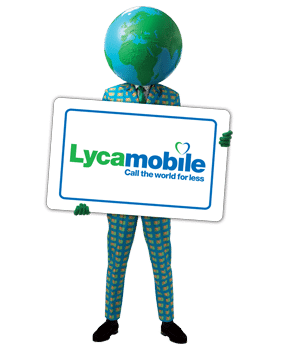 How to buy the Lycamobile Data bundles? Buying Lycamobile Data Bundle is very simple. Just dial the activation code given for each data bundle and follow the instruction on the screen of your phone. Customers will pay for each bundle from their existing balance on their Lycamobile SIM. Therefore Customers are advised to have enough balance on their Lycamobile SIM to activate each bundle. If you do not have enough balance, then Top up your Lycamobile. If you are a new customer you would like to request a Free SIM. All Lycamobile Bundles are subject to be renewed automatically once they are expired; Lycamobile customers are advised to have enough balance at the time of expiry of each bundle. Please call our Customer Service if you would like to stop your Auto Renewal. The offer is valid from 17/01/2018. Lycamobile Philippines Globe bundle (‘the offer’) inclusive allowances are for calls from Austria to the first 5 dialled Globe telecom mobile numbers in Philippines only. Other usage for those exceeding maximum of first five dialled numbers and usage in excess of your bundle allowance will be charged at standard rates. Calls are rounded up to the nearest minute for the purpose of calculating remaining allowances. Bundles are valid for 30 days from the day of purchase. A customer may have only one offer on their account and may not buy another during the validity period. Any remaining allowance after the validity period will not be carried over into the next period should the customer repurchase their offer. Lycamobile reserves the right to replace or amend the offer or these Terms & Conditions or to withdraw the offer at any time on reasonable notice. Note that promotional credit (credit which Lycamobile has given to customers for free) cannot be used towards purchasing a bundle. The offer is for non-commercial, private, personal use only – Lycamobile reserves the right to withdraw or suspend the offer or to disconnect service if we suspect that the offer is being used for commercial purposes, for conferencing, if it is not being used in a handset, if it is being used for tethering, or is being used in a SIM box or similar use. Promotional period: the offer is valid from 01/02/2017.